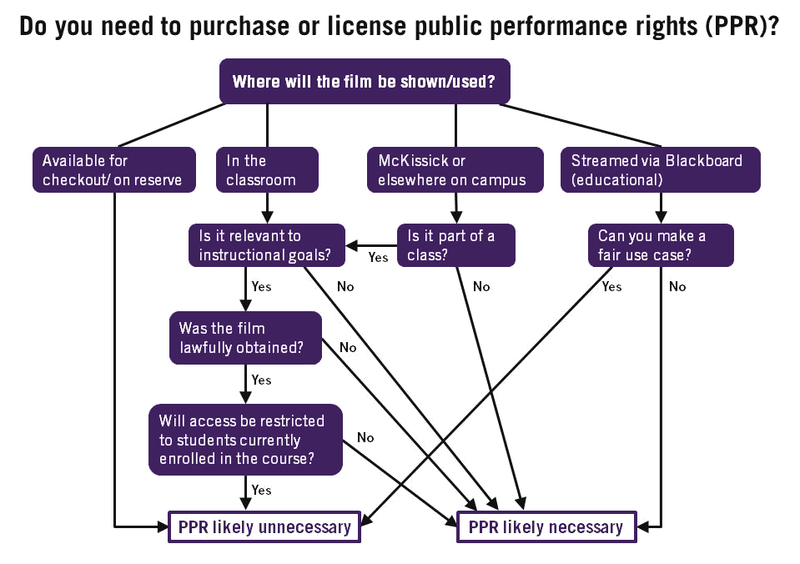 If you wish to show a film in a public setting, even if you own it, borrowed it from the library, or otherwise legally obtained it, you may need to purchase public performance rights (PPR). Typically, these rights are managed by the distributor or producer of a film, who can grant you the rights to show their work publicly through a public performance license. It is your responsibility to determine whether your use of a film necessitates the purchase of public performance rights and to obtain those rights when required. Clemson Libraries are not responsible for purchasing PPR for materials it already owns; this guide is for your information only. Do you need Public Performance Rights? The film will be displayed in the context of face-to-face teaching in the service of regular curricula with access limited to students currently enrolled in the course. See Section 110 of US copyright law for additional information. The film will be displayed outside of regular curricula. Examples may include: student club events, film series, lectures, other extra curricular events. To assist in your determination, you may ask yourself the series of questions represented in the PPR Decision-Marking Flowchart. Does Clemson Libraries Purchase Public Performance Rights? Typically, the Libraries purchases films for in-home use and face-to-face teaching only. In some cases, though, we may have purchased films with public performance rights. To find out if a film you would like to publicly display was purchased with public performance rights, please email Derek Wilmott. PPR for films can typically be obtained through a distributor. Criterion Pictures USA and Swank Motion Pictures, Inc. can offer PPR for most major films. Please contact one of them directly for pricing information.